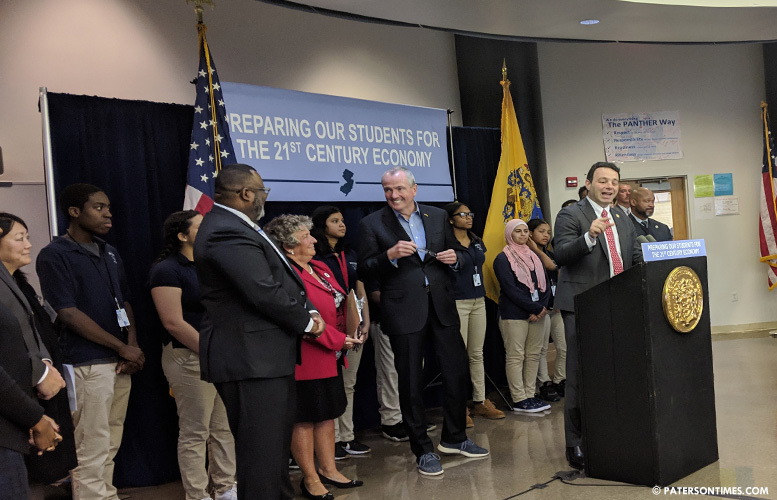 Three New Jersey high schools, including Panther Academy in Paterson, are part of a new initiative to prepare students for what’s called “new collar” jobs, announced governor Phil Murphy on Tuesday afternoon. Students in the P-TECH (Pathway in Technology Early College High School) program will graduate with a high school diploma, associate degree in a science, technology, engineering, and mathematics (STEM) field, and workplace experience within six years. The P-TECH model was co-developed by IBM. It is similar to the apprenticeship model prevalent in Germany, said Murphy, former ambassador to European country. The program at Panther Academy will be run in partnership with IBM and the Passaic County Community College. Suh said each student will be paired with an industry mentor. Students will be placed in paid internships with industry partners. Graduates will be first in line for jobs with industry partners, she said. Murphy’s administration has set aside $900,000 for the initiative. $400,000 from state and $500,000 from a federal grant. Each school will receive $300,000. A school will have 25 to 30 students in its P-TECH program. School board member Jonathan Hodges asked Murphy about the state’s funding commitment to the program. “This is not an in and out shot,” said Murphy. He said the program will be funded through the duration of his administration. Murphy said the state selected the three schools – Panther Academy, New Brunswick High School, and Burlington City High School – based on need. New Brunswick’s corporate partner will be Edwards Engineering and Burlington’s corporate partner will be Centryco Inc. The program starts in the 2019-20 school year.